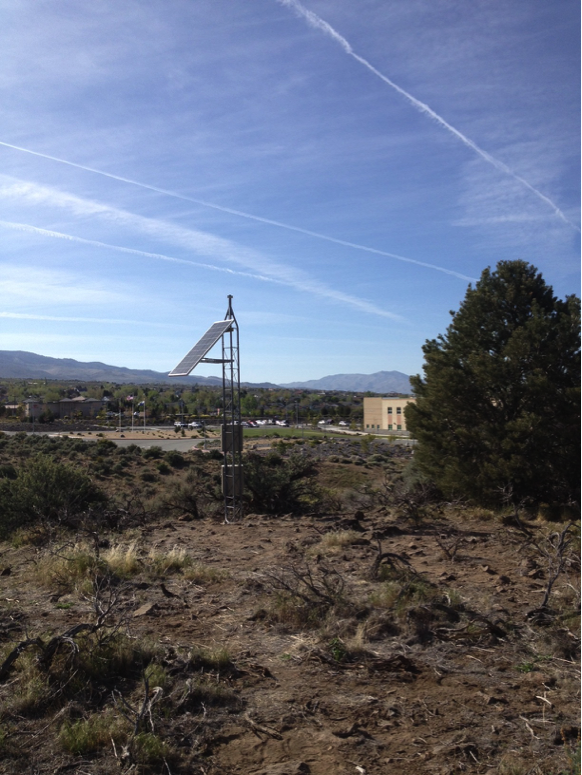 The Nevada Seismological Laboratory (NSL) at the University of Nevada Reno is seeking landowners near Las Vegas and in central and eastern Nevada who are interested, and willing, to allow NSL to install a high-quality seismograph station for monitoring local and regional earthquakes. Although we would like to consider these are permanent installation, we would immediately remove a site at any time if requested. Nevada is the thrird most seismically active State in the US, and despite the high-rate of seismicity, there is little to no seismograph coverage in the central and eastern regions of the state. Improved monitoring will allow us to provide more accurate information to local communities and to better assess the seismic potential in many areas of the state that lack quality seismic stations coverage. Below is a picture of a seismograph station. The installation is about 14 feet tall, the tower is secured in at 16x16 base, and the sensors are buried in a nearby vault. We would prefer a site that is near hard rock, and preferably not easily visible. It would be painted with local color to also reduce visibility. Once installed, the site would require only one or two visits per year. The system runs on 12 volts and is not an electrical hazard. If you may be interested in hosting a seismograph station we would love to hear from you and answer any questions you may have. We are looking for five (5) potential sites in the Las Vegas area, and as many as eight (8) in central and southeastern Nevada.